Asian Street Food - Is it Safe? Travelers often wonder if Asian street food is safe to eat. Some guidebooks warn against enjoying treats from the many street carts, but travelers and locals alike are often lined up for good, cheap food from the many carts that line the streets of Asia. From quick snacks to entire meals, you can often find the cheapest meals and most interesting cultural experiences by skipping the tourist restaurants and instead visiting the many street food carts in Asia. Sometimes called hawker food, noodle carts, street carts, or hawker stalls, street food is served from simple carts that usually specialize in one dish or only a small handful of offerings. Because the cook solely prepares the same dish night after night, they master it well. Don't expect a restaurant experience! Eating street food in Asia is about one thing: the food. With the exception of food courts where many hawker carts set up under one roof, you may find yourself perched on a simple plastic stool or even sitting on the dirty curb. Without the need to pay rent or hire many staff, street food vendors have low overhead and can offer quality food at a better price. Time and energy are rarely wasted on ambiance; instead, the cook focuses on serving great food for the lowest price possible. While you may or may not have a comfortable place to sit, Asian street food is almost always cheaper than similar offerings in restaurants. Rather than commit to a single dish, you can often nibble, sample, and try several local specialties without breaking your budget. See these 10 budget travel tips that backpackers use to travel cheap! Is Asian Street Food Safe? If you haven't encountered Asian street food before, don't be afraid! Seeing raw meat hanging by the side of the road can appear a little daunting to the uninitiated, but hawkers often feed their friends, family, and themselves from the same cart; they don't want to make anyone sick. See the best ways to avoid getting a bad stomach while traveling. Unlike the food cooked behind curtains in dirty restaurant kitchens, your cook prepares the meal directly in front of you within plain view. In places such as Penang, Malaysia, hawker food carts serving bad or dangerous food would not last long! Competition is often fierce. The old travel mantra holds especially true when it comes to Asian street food: go where the locals go. The best way to ensure a safe street food experience in Asia is to patronize carts that have a high turnover. The more customers served, the better your chance that ingredients are fresh because they must be purchased daily. 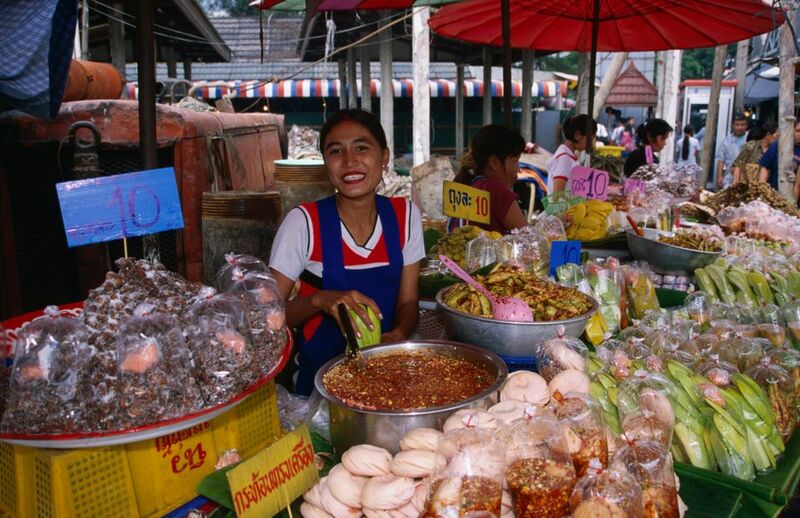 Learn more about the delicious food in Southeast Asia. NOTE: A lot of street food in Asia contains MSG. Look for busier carts -- this is a good sign that ingredients are fresh and the food is good. Eat at carts frequented by locals; no one knows better where to find good food than the local residents. Get away from the tourist strip. Simply going a street or two away from the main tourist drag often yields better food by more expert cooks who care more about their customers. Bring small change as a courtesy. Hawker carts are the worst place to break that big banknote you just got out of the ATM. If you buy a drink, leave the can or bottle at the cart. Many places in Asia have a return on bottles and cans; lots of street food vendors take advantage to offset expenses. Learn more about responsible travel. Cooks will often customize your order; they will happily leave out an ingredient that you do not like -- it increases their small profit margin.